Sushrut: Sushrut: Watch rajasthanveterinary.com website in New Look and New Features! Sushrut: Watch rajasthanveterinary.com website in New Look and New Features! Its a platform for Veterinarians to share professional knowledge, increase outreach to animal lovers and connect with the pet owners, breeders and pharma companies. 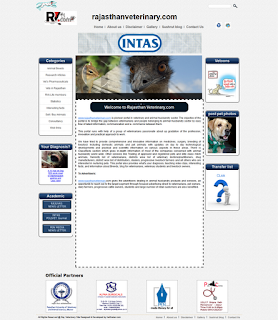 INTAS,is our major partner and RAJUVAS - Veterinary University is our Knowledge partner. We are a venture of PEN MEDIA FOUNDATION SOCIETY. Alpana Surgicals and PET Clinics are our supporters! HLO SIR HOW MANY TOTAL SEATS ARE THERE FOR BVSC THIS TIME IN RAJASTHAN..??? PLZ.. TELL I WNAT TO TAKE ADMISSION IN BVSC??? I HAVE APPEARED FOR RPVT 2013 .. MY OVERALL RANK IS 347 .. SIR GIVE ME IDEA..